It’s on our desks. It’s in our bedrooms. It’s even in our pockets. Often, it feels like the web has found its way into every part of our lives. While that may be true in some places, internet access across much of the world remains prohibitively expensive or altogether unavailable. But the landscape is quickly changing. In June 2012 an estimated 2.4 billion people, 1/3rd of the world’s population, had internet access. That number is only expected to grow in coming years. Especially interesting is where internet access is growing most and how the web is being used in those places. Rather than wasting internet ink trying to explain further, I’ll let a chart do the talking. There are a few points worth noting here. Unsurprisingly, internet access is most prevalent in high-income nations (e.g. the United States, most European countries), but the rate of growth in these nations has slowed in recent years. While the populations of developing nations still have limited access, recent growth there has been extraordinary. 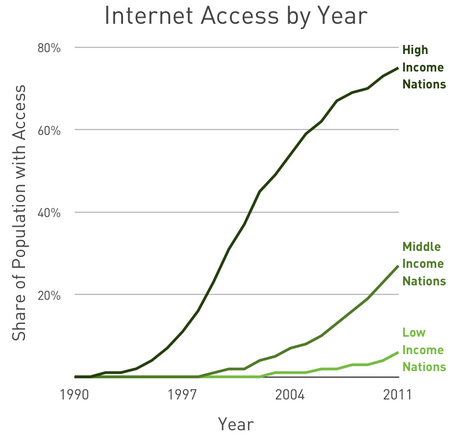 In the past five years alone, internet access has doubled in countries such as Nigeria, China, and Egypt. The expansion rate of internet access in emerging markets parallels that of first-world countries during the early 2000s, but the method of growth is unique. Many developing nations have weak and limited infrastructures. Because of this, mobile devices are often the only means of web access. And people are hooked. Mobile phones and 3G modems account for 99% of Kenya’s internet connections. In Brazil, mobile usage has tripled in five years. Six of ten web users in India exclusively use mobile devices to get online. Given the growth of mobile access, especially in lower-income countries, Forrester Research predicts that the worldwide number of mobile users will surpass PC-based users as early as 2016. If you are a global brand, there is no doubt you are attracting visitors from around the world. But even if you are a small business serving a local audience, there’s a pretty good chance that some users are visiting your site from outside your immediate geographic area. For example, US visitors make up only 37% of Viget.com’s total traffic. Find out where your visitors are located and what languages they are speaking. Explore their cultural norms and work to accommodate their unique expectations. Consider serving customized content based on a visitor’s language or geographic location. Mobile devices are an increasingly popular means of access in both emerging and developed markets. On average, mobile visits account for 12% of traffic, but that proportion varies significantly by country and individual website. Identify what devices people are using to visit your site, how their behavior differs from that of “traditional” visitors, and how you can best appeal to their specific constraints and needs. While it is getting cheaper, mobile data is still expensive, especially in developing nations. As traffic from these areas continues to grow, site speed and size will become even more critical to your online success. To remain competitive, work toward efficient and effective designs that meet users’ needs without exorbitant data requirements. At Viget, we’ve already noticed many of these changes reflected in traffic to our clients’ sites. We’re excited to continue growing and adapting our work to reflect the shifting face of the web. How are you modifying your work to engage the changing online audience? Please share.